Welcome to CMATS led by Jordan Dellabough and affiliated with the Remy A. Presas' International Modern Arnis Federation led by Successor Jeffrey Delaney. CMATS Curriculum DVDs now available in our Store!! Modern Arnis WINTER Camp 2019 Feb 2nd and 3rd, 2019 - register as soon as possible!! Video 1 YouTube version here! Video 2 YouTube version here! Video 4 YouTube version here! For more than 50 years, Remy Amador Presas pursued his passion for the stick, knife, sword, dagger and empty hand in the name of Modern Arnis, the Philippine martial art he created and refined. Professor's ideas and energy live on in what is 'the art within the art'. 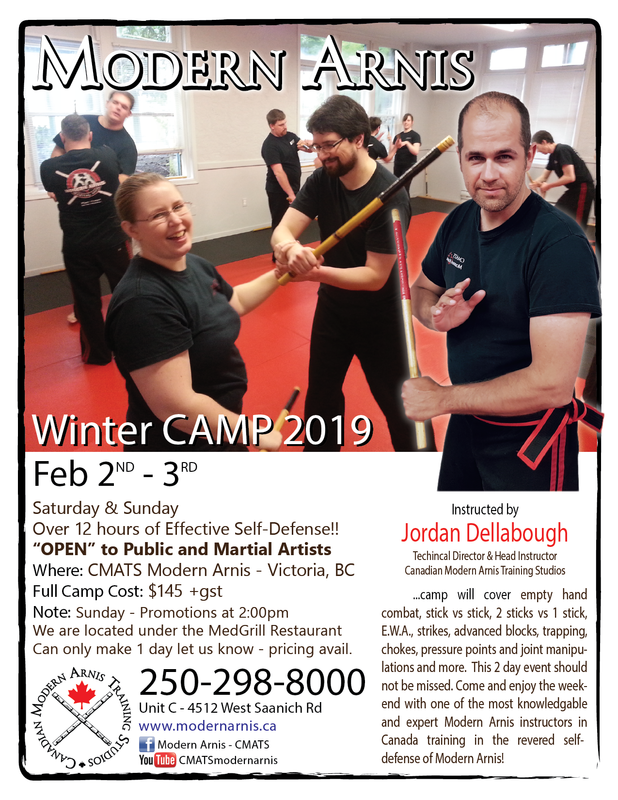 Jordan Dellabough of CMATS will teach a 2-day intensive Modern Arnis Winter CAMP open to the general public as well as martial artists of all styles and skill levels. This is the 17th camp to be held in Victoria! This camp is an opportunity to have fun training empty hand combat, 2 sticks vs 1 stick, E.W.A., stick vs stick techinques and more...! Jordan Dellabough and CMATS Martial Art present a 4 hour knife awareness seminar open to the public and martial artists of any background. Defence will be the main theme with theory, practice and valuable understandings through drills and techniques.